COLLIER COUNTY — An East Naples women said she is happy to be alive after a Sunday boat outing on the Marco River brought an unexpected guest onboard – a fully-grown bottlenose dolphin. JoAnn Lorek and five companions were on their way to a beach picnic in a 22-foot private boat when the dolphin – reportedly 600 pounds – jumped onto the boat and pinned her ankle. Though Lorek, a part-time Fiddler’s Creek resident, came away with a sprained ankle and some bruises, it took aid from three response agencies and other volunteers to remove the dolphin from the boat. As Richard Johnston’s private boat was travelling on the Marco River on Sunday afternoon, Lorek said she and the other occupants noticed active dolphins in the area. 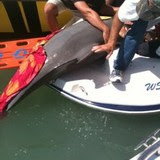 She said no one on her boat was feeding the dolphins, but Johnston slowed the vessel as a precaution. Lorek said she was looking around for other dolphin activity when one leaped it the air toward the boat. “I just saw this wall of dolphin,” she said. 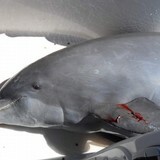 Lorek reported that she felt the dolphin graze her head on its way down, probably with its fin, before it landed on her ankle. 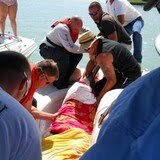 She said the incident could have been deadly if someone had been standing directly in the dolphin’s path. Firefighters with the Isles of Capri Fire Control and Rescue District, officials with Florida Fish and Wildlife Conservation Commission and Collier County Sheriff’s Office deputies, as well as a few private citizens, worked to rescue the dolphin. However, its weight posed some problems. “There were 10 full-grown men and we couldn’t lift it,” said Lt. Keith Perry, an Isles of Capri firefighters. Lorek said at first the dolphin seemed panicked. It shook its flippers so hard it left flipper-shaped bruises on her leg. It finally relaxed when rescuers covered its eyes. Since the marine mammal couldn’t be lifted, officials tied a rope around the tail of the dolphin and slid an immobilization board under it. Then they slid the marine mammal toward the end of the boat. Once the dolphin was halfway off, Perry said the rope was removed and they slid it back into the water, where it swam away without incident.